How do I track books? How do I set up the eBookTracker to receive Email Alerts? How can I stop or change the email alerts I am receiving? How do I set up the eBookTracker Email Alerts for individual books? What are "Groups" in eBookTracker? What are eBookTracker Email Alerts? View Stats – view historical statistics on the selected book, since you started tracking it. Refresh – refresh the current information on the selected book. Move to a Group – move a single selected book to a different group or all the books in a selected group to a different group. Copy to group – copy a selected book to a different group. Delete – delete a single selected book or a selected group. Click on the register link above; enter your email and a password and click the register button. Shortly you should receive a confirmation email with a link to confirm your account. IMPORTANT: your account is not set up until you click on the confirmation link within the email. Select the button. You will see the search pop up box. Search for any book by either using a keyword such as the Author’s name or the title of the book: or by the ASIN number. Click on the search button. If you click on the yellow button on the far right you will get the options to add your selection to a group. If you have not set up any groups yet, you will only be allowed to choose the default group, but you can change that later. When you have added your book to a group you will see a confirmation and the yellow will turn to the green confirmation button . Log into your account and at the far top, right you will see the "Settings" link. Click on the "Settings" link. Under "Change Default Notification", there is a purple "Change" button. Select the purple change button and in the pop-up screen select the “Daily Email Digest” option. Select the “Close” button in the pop-up screen. Select the “Apply to All Existing Tracked Books” checklist if you want to add all your currently tracked books. You will be able to select individual books later. IMPORTANT: You need to click on the “Save” button for these changes to take effect. After you log on to your account, click on the “Settings” tab. Click on the purple “Change” button in the “Change Default Notification” section. You should now see the Change Notification Type screen. 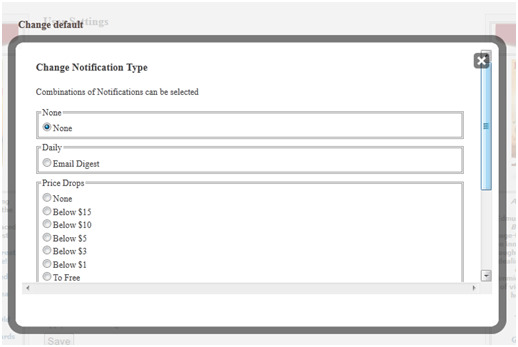 To change the type of emails you receive, select or unselect the alert options. To stop receiving all eBookTracker email notifications select “None”. This will stop you from receiving any further email alerts, but your tracked books will still be available when you log on. Important: Please note that you need to scroll to the bottom and click “Close” for your changes to be saved. You are now brought back to the “Change Default Notification” section. Select the “Apply to all Existing Tracked Books” check box if you want the changed you have made to exist globally. Then click the “Save” button to make your changes permanent. At the top of the page you should see "Default Notifications has been changed for all Books"
Go to your “Tracked Books” list. Find the book that you want to add to your email alerts. On the far right is the icon bar. Click on the purple icon to view/change your Email Alert status. All books chosen by the user for tracking are added to his or her "Default" Group by default. 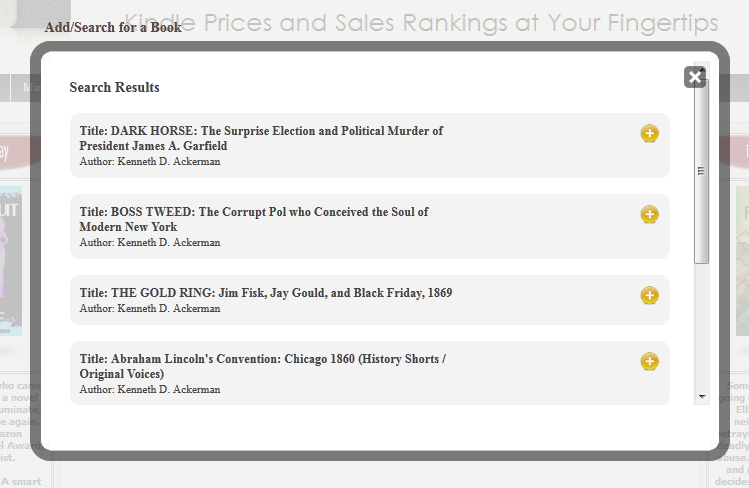 The user also has the option of creating custom Groups according to his or her own criteria (e.g., by genre, author, or any other form of categorization the user wishes to employ) in order to categorize his or her collection of tracked books for easier retrieval of sales rank and pricing data, or to facilitate 'at a glance' comparisons among books. The user can move books, or copy them, into one or more of these custom Groups as desired. Books can be listed in as many Groups as the user wishes. For example, a user might wish to track Neil Gaiman's The Graveyard Book in a custom Group she's created and named "YA/Kids", as well as in a custom Group she's created and named "Award Winners", or "Neil Gaiman". Users can opt in to receive email notification of sales rank or pricing changes according to criteria specified by the user. For example, he may ask to be notified when the price of a specific book he's tracking drops to .99. These alerts can be set on a book-by-book basis, and can be turned off at any time the user wishes. Copyright © 2007 - 2019 Windwalker Media. All Rights Reserved. Kindle Nation Daily and its subdomains are participants in the Amazon Services LLC Associates Program, an affiliate advertising program designed to provide a means for sites to earn advertising fees by advertising and linking to Amazon.com. Apart from its participation in the Associates Program, Windwalker Media, Kindle Nation Daily and its subdomains are not affiliated with Amazon or Kindle in any other way. Amazon, Kindle and the Amazon and Kindle logos are trademarks of Amazon.com, Inc. or its affiliates. Certain content that appears on this website is provided by Amazon Services LLC. This content is provided "as is" and is subject to change or removal at any time. Windwalker Media, Kindle Nation Daily and its subdomains are published independently by Stephen Windwalker and Windwalker Media and is not endorsed by Amazon.com, Inc.